The garage with yesterday's Birdo mural runs behind this street of lovely Victorian semi-detached homes just north of College St. Each home has a garage behind that is accessed by the laneway which should leave the streets car-free but that is not usually the case. This is the typical type of home in the older parts of the city and each of these could set you back by somewhere between one and two million dollars or even more if there has been a super upgrade of the kitchen etc. Our prices are crazy! What's even crazier is that many of these homes really need extensive renovation in terms of plumbing and electrical work ... at least that's what I've learned from HGTV! I do like them, though, and would probably be happy in one so long as it was detached. The prices are absolutely nuts. Where do people get this kind of money. A million bucks down here would get you a mansion on ten acres with every amenity you could imagine. Yes, the housing prices are definitely out of control there. Those are certainly crazy prices but unfortunately, standard for big cities these days. What a pretty row of homes. It's nice to know that in back of them is a garden of colorful garage doors. 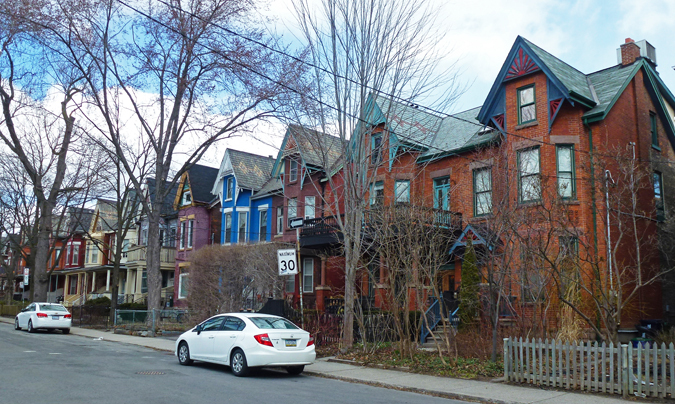 A beautiful row of homes, I like the different colours. Wonderful looking old homes, but the prices are excessive. This is one reason we have a housing crisis, and a shrinking supply of affordable homes. A million or two? What heck, buy two and attach them! Back in the day... affordable and thriving bohemian housing! What a delightful row of homes and an equally lovely setting. Prices are astronomical all over the world. One wonders when the real estate prices will become more stable. These are nice brick homes. There are similar ones in Hartford, but the owners would be lucky to get $400,000 for one. The prices look like amsterdam. The houses not. Our prices are outrageous for these lovely buildings as well!